In an almost uninterrupted advance from the December 26 low at 2346.58, the S&P 500 Index closed last week well above the 200-day Moving Average after four recent attempts. However, looking back to October, the last three time it closed above resistance at the 200 all quickly reversed to close back under the average. Perhaps it's difference this time since the operative downtrend was exceeded while the prior three attempts were under the influence of the downtrend. 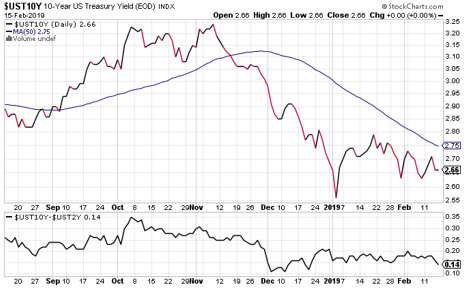 The market review below has more including a breadth update as well as the important 10-2 Treasury Note spread. S&P 500 Index (SPX) 2775.60 ended the week 67.72 points or +2.50% higher after a 29.87 point advance Friday to close well above the 200-day Moving Average that had been resistance for the last two weeks. It now seems likely resistance at "Target 200" could become support on any pullback. Should the current uptrend continue ,it will take a close back above the October 3 high at 2939.80 for the longer term uptrend from the February 2016 low at 1810.60 to resume. 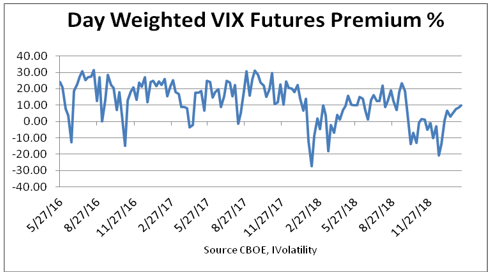 The premium measures the amount that futures currently trade above or below the cash VIX, (contango or backwardation) until front month future converges with the VIX at expiration. Previously, declines below 10 % and advances above 30% were unsustainable, but for the last year premiums above 10% have been scarce. If there was only one indicator available, this one would be a top contender. With 22 trading days until March expiration ,the day-weighted premium between March and April allocated 88% to March and 12% to April for a 9.88% premium vs. 8.26% the previous week ending February 8, at the bottom of the green zone between 10% to 20% associated with S&P 500 Index uptrends. 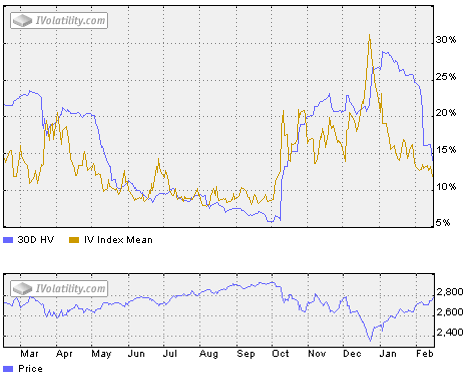 This chart shows little hedging enthusiasm with options on VIX Futures. 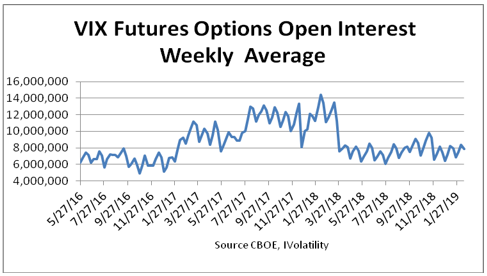 Friday's volume of 6.2 million contracts seemed low before a Monday holiday, while the open interest was 7.9 million contracts vs. 8.4 million the week ending February 8, 2019. Market Breadth as measured by our preferred gauge, the NYSE ratio adjusted Summation Index that considers the number of issues traded, and reported by McClellan Financial Publications, gained 185.91 points or +20.68 % for the week ending at 1084.78, having crossed above the 50-day Moving Average (blue line) on January 10. While the momentum slowed it's well above the important 500 mark and continues higher. The 50-day Moving Average has been a reliable timing indicator and could make an interesting trading system. The 10-2 Spread measures the difference between the 10-Year and the 2-Year Treasury Notes. While the spread is also calculated between other maturities, such as the ten year and the one year, the 10-2 seems to attract the most attention. Now at .14, this six month chart shows it back near the lows reached in December. For the significance of the spread here are selected quotes from the FRBSF Economic Letter, Economic Forecasts with the Yield Curve. "Every U.S recession in the past 60 years was preceded by a negative term spread, that is, an inverted yield curve." " The central feature of the business cycle is that expansions are at some point followed by recessions. Long-term rates reflect expectations of future economic conditions and, while they move up with short-term rates during the early part of an expansion, they tend to stop doing so once investors’ economic outlook becomes increasingly pessimistic. A flatter yield curve also makes it less profitable for banks to borrow short term and lend long term, which may dampen loan supply and tighten credit conditions. Despite these plausible explanations, the complex relationship between interest rates and the macroeconomy makes it difficult to pinpoint the exact mechanism underlying the link between yield-curve inversions and economic slowdowns." " An extensive analysis of various models leads us to conclude that the term spread is by far the most reliable predictor of recessions, and its predictive power is largely unaffected by including additional variables." As long as the S&P 500 Index remains above the downward sloping trendline from the October 3 high and breadth continues improving, odds favor the bulls. However, since the options and futures indicators appear skewed toward the bull side, it could be a set up for a "sell the news" event should there be a China trade agreement announcement. The S&P 500 Index continued higher closing well above resistance from the 200-day Moving Average that will now act as support if there is any attempt to retest the December 26 low. Next the plan includes a look at our Probability Calculator along with a regular market review.